Photograph of the east front of the Hoysaleshwara Temple at Halebid in Karnataka, taken by William Henry Pigou in c. 1855, from 'Architecture in Dharwar and Mysore'. Halebid (ancient Dwarasamudra), a small town in the Hassan district, was once the capital of the Hoysala dynasty of the southern Deccan which flourished from the 12th to the 14th century. Invasions by armies of the Delhi Sultanate led to its decline by the mid-14th century. The Hoysalas were prolific temple builders and the site is renowned for the remnants of architecture and sculpture fashioned out of the chloritic schist in the region. The most famous monument here is the Hoysaleshwara temple dedicated to Shiva as Nataraja, the Cosmic Dancer, which was built for Ketamalla, an official of Vishnuvardhana (ruled c. 1108-42). It is an exemplar of the lavish Hoysala style and is encrusted with continuous bands of sculpture, unsurpassed in its detail and vibrancy. The temple, placed on a high platform, is twin-shrined or dvikuta, with each linked shrine preceded by a Nandi pavilion. Each of the twin temples has a sanctuary and an attached pillared mandapa or hall. There are four entrances to the temple, two to each main shrine, each approached by flights of steps with free-standing miniature shrines at either side. 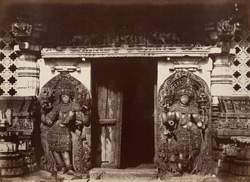 This photograph takes a close view of the finely carved dvarapalas or guardian figures flanking an entrance doorway.